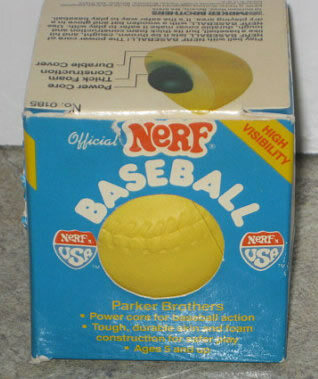 As mentioned in the past here on FASTE, I've been looking for an original Nerf baseball for quite some time. There are spongy baseballs in just about any store you go to, but I want one of the originals marketed by Nerf back in the 80s. As you may recall from my post on backyard baseball (probably my all-time favorite post on this site, by the way), this was the kind of ball that we frequently used in my neighborhood. You could swing for the fences every time and not ever have to worry about bodily harm to your friends or damage to neighborhood houses. Finding an original Nerf baseball has proven difficult. In a few cases, I stumbled upon some pictures of one -- one even in its original box -- only to discover that the ball was part of a sale or auction that ended long ago. This past spring, I came up with a Nerf softball. Close...but not quite the same. Then the eBay gods smiled upon me. (FYI, the eBay gods are not to be confused with the cereal gods). I can't say I won't continue to look for one in the original box, but this is exactly what I've spent the past few years searching for. Nice to have one less thing on my holy grail list. I love getting stuff like that. Holy Grails. I have original nerf baseball new in box. Even has vintage walmart price stickers. Wouldn't mind getting rid of it for right price. Text (209)346-6758 if ur interested.